The Green Man–or Woman–cares for our natural world. What is her response to our urban environments? 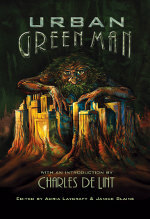 “The Gift” was first published in The Urban Green Man, edited by Adria Laycraft and Janice Blaine (2013). It is available through Edge Press. “The Gift” was a finalist for the Prix Aurora Award for best short fiction. Honky tonk blared through the smoke, pulsing against bodies glistening in the heat. Bass thrummed the boards beneath Syd’s stomping boots, and sweat soaked his fringed shirt. Beer blurred colors into one reeking, dizzy cacophony. Syd had lost his battered Stetson hours ago, along with his hearing, but he was partying madly with the best of them. Something firm grasped his left ankle. Syd bumped back into hips and whipping hair, peering down where a flash of light strobed between gyrating legs. A vine writhing through rough floor boards grasped his leg. The glitter ball spun and the two-steppers shifted. In the sudden dark the sensation wound up his thigh and belly, thickening from filament to embrace. Where the stalk had sprung up, a verdant woman now draped over his shoulder, leg wrapped about his in a Lambada rhythm. Syd shouldered away from a faceless partner and put his arms around this new companion. The woman before him, with skin of deep mahogany green, leaned back, perfect eyes closed in rapture, shapely arms curling, branching, undulating to the music, locks of hair swaying, questing, blossoming. She wore–no, sprouted–a dress of clematis silk, strands like downy hair clothing her from her collarbone to the tips of her uncountable arms and legs. Languidly she opened her eyes, smiling into his, and he was in love. “Liv,” she called back, drifting away, eclipsed in the sea of dancers. Syd tried to follow, but the room had revolved into a new configuration, and the woman of moss and fern and leaf was gone. The dance floor flickered beneath the spinning ball, sterile and airless. A girl with a gold-crusted cleavage do-se-doed with him, and one with kaleidoscope eyes, and one sheened in a black and oily ooze. But he yearned for Liv’s unspoiled beauty and gentle nature. He stumbled through drum beat and fume, through halls of pistonlike dancers and the shutter shift of line dance, through coal dark salons pierced with lightning brilliance. And there, in a far alcove, the woman with the tendril hair swayed, as if to a breeze rippling a field of corn. She raised a brow, and he reached into his breast pocket and pulled out a silver trinket. He held it up for her to see. “You like it? A necklace.” Blinking back the sweat stinging his eyes, he fastened the chain of silver houses and hotels about her throat. He loved her. He would do anything for her. “And hair clips. Look.” He pulled the strands from the side of her face and clipped them back. “See? This here’s a jet plane.” He turned her to view herself in the bar mirror. He pulled her hair back on the other side of her face. “See? A cruise ship.” He slicked her hair with oil. She watched him quizzically in the glass. Liv drew back in doubt. New snakes of hair began to move and grow. “No!” He slapped her, and felt the nausea rise again. “Don’t do that. You’ll spoil it.” He snipped the new growth and spun her back to him, reeling with her. “Now.” He put the scissors back on the bar. “Watch this.” From the wall beside her, he peeled back a thin layer of greasy stone, and draped it over her body. “Concrete and asphalt,” he beamed, and he decorated the gray dress with yellow lines and colored lights. Syd held his hands up. “You’re good. You’re fine. Just one more…” He retrieved the scissors and snipped her arm off at the shoulder. “There.” Snip. Snip. Another arm. A leg. A third arm. The smoke and the music rose crescendoed, and Syd leaned over her, retching onto her face and shoulder and dress. Stomach writhing, he slumped to the floor at her feet. She looked down at him, sad and wistful, her beauty unmarred beneath his decorations. Then, cracking the concrete of her dress, a limb burst forth from the middle of her chest, green and growing toward the ceiling. A snake of hair popped the trinkets from her head and curled and twisted to the beat of the lullaby. She straightened, shooting roots around him. A branch split the wall of the bar. And blossomed in the starry midnight air.